The Online Journalism Handbook has established itself globally as the leading guide to the fast-moving world of digital journalism, showcasing the multiple possibilities for researching, writing and storytelling offered to journalists through new technologies. 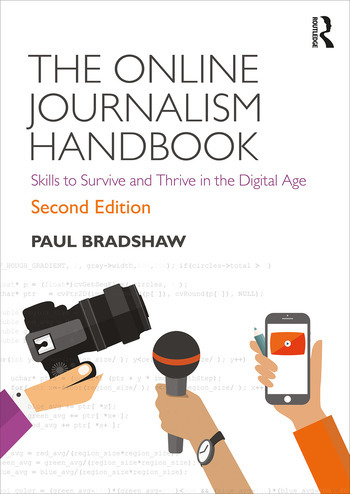 In this new edition, Paul Bradshaw presents an engaging mix of technological expertise with real world practical guidance to illustrate how those training and working as journalists can improve the development, presentation and global reach of their story through web-based technologies. advice on the journalistic uses of vertical video, live video, 360 and VR. The Online Journalism Handbook is a guide for all journalism students and professional journalists, as well as being of key interest to digital media practitioners. Paul Bradshaw established and leads the MA in Data Journalism and the MA in Multiplatform and Mobile Journalism at Birmingham City University, UK and works with the BBC England data unit. He publishes the Online Journalism Blog, founded the investigative crowdsourcing site Help Me Investigate, and is recognised worldwide as one of the leading lights in online journalism, data journalism and social media. His other books include Finding Stories in Spreadsheets (2016), Snapchat for Journalists (2016), The Data Journalism Heist (2015), and Scraping for Journalists (2017). Tim Crook is Professor of Media and Communication, Head of Media Law & Ethics and Radio at Goldsmiths, University of London. He is also Visiting Professor of Broadcast Journalism to Birmingham City University. He has worked professionally in radio, theatre, television and film as a journalist, producer, playwright, director and sound designer for more than 40 years. Throughout this period he has taught media law and ethics to professional journalists and students at all levels.